With Trump’s barrage of absurd “alternative facts,” his administration attempts to cover up the scientific analysis that points to a systemic ecological crisis. In order to avoid a major catastrophe we must drastically reduce the use of carbon as an energy source, transitioning to sustainable energy within twenty years. There is no technical fix or more efficient use of coal, gas, oil, or nuclear power that will do the job. Carbon as an energy source is linked to other ecological and social problems. Perhaps the most pressing is the reality of 65 million refugees, many of whom are fleeing from war. Wars in Somalia, Sudan and Syria were preceded by destabilizing droughts. The ecological crisis has threatened the ability of rural communities and indigenous peoples to maintain their way of life. And even those seeking sanctuary in other countries can find themselves forced into their host country’s neighborhoods with the worst environmental degradation. Flight from climate change does not promise safety. 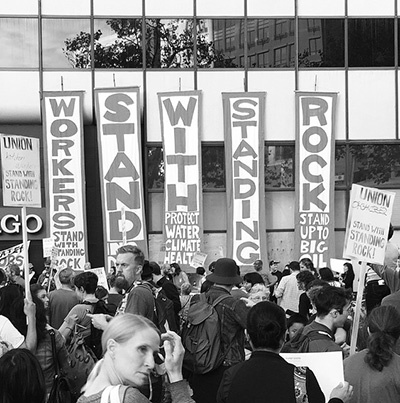 Workers hold a sign reading “Workers Stand with Standing Rock” at a demonstration in the Bay Area. Photo by Alex Chis. Trump promises to intensify the production of coal, fracking, and oil through cutting health and safety regulations and dramatically downsizing the Environmental Protection Agency. Construction union officials and some unemployed miners were delighted with these promises. Yet these are the very same people who suffer debilitating health injuries from their work! Continuing to measure “progress” by the expansion of commodity production and industrial agriculture will lead civilization to a dead end–more droughts, intensified storms, greater inequality, diminished health, and more refugees. Capitalist methods of agricultural and industrial production rely not only on the use of fossil fuels but competition that requires continual expansion. Businesses must either grow or perish, accumulating greater profits for their owners. This drive for profits dictates that each company must find labor and resources at the cheapest cost. With the scientific community sounding the alarm not just on climate change, but on the links between the air we breathe and the acidification of oceans, the destruction of coral reefs, the extinction of species, the growth of atmospheric pollution, and the degradation of the soil, we demand an economic reorganization that can restore an ecological balance, beginning with food sovereignty and mass transit. Where will there be jobs if the country reduces its dependence on fossil fuels? Instead of building more pipelines that go through indigenous lands and under the rivers and lakes that provide pristine water, we need to be building the infrastructure for solar, wind, and water energy, for public transportation and insulating, weatherizing, and renovating buildings. That also means ending a military budget that eats up our resources and teaches us that violence is the way to protect ourselves. Our safety lies in facing climate change head on. In place of fossil fuel-dominated industries, we demand safe jobs that benefit our communities. Our rulers will try to make workers pay for the cost of moving toward environmental sustainability. We cannot allow that! Workers didn’t make this mess, there is no reason why workers should pay for it. We assert that working people and communities must be fully compensated as work sites are retooled or shut. The demand for a “just transition” is essential. Central to the project of transition to a sustainable future is the vision of a society where working people will have the capacity to collectively solve the ecological issues that face us. That means rejecting the notion that people who are fleeing from droughts, wars and repressive regimes are to be feared rather than embraced. As allies have done in supporting the Black Lives Matter movement, U.S. citizens can stand in solidarity with those who are impacted by the global ravages of capital. Together we can challenge growing inequality with the demand that “no one is illegal.” On April 22 and 29 and on May 1, we march to affirm that another world is possible–one where justice, equality, and sustainability replace the greed and cruelty that characterize the proto-fascist neoliberalism of the Trump administration and the economic system upon which it rests. We need a socialist economy where it’s working people who collectively make the decisions. Today’s struggles are how we build toward the future that we need and desire. This statement was produced by Solidarity’s Ecosocialist Working Group as a leaflet for the upcoming climate and science marches. You can download a PDF of that leaflet here.